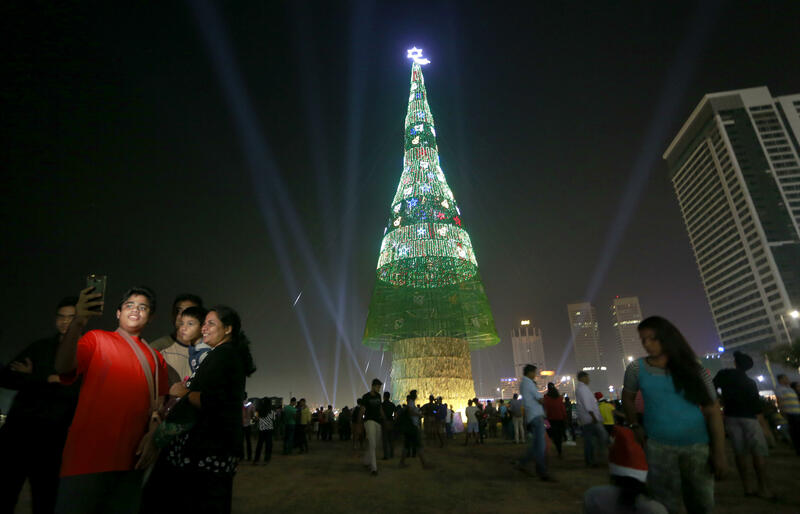 COLOMBO, Sri Lanka -- Sri Lanka unveiled a towering Christmas tree on Saturday, claiming to have surpassed the world record for an artificial Christmas tree despite constructions delays and a shorter-than-planned finished product. The 238-foot tree, built in capital Colombo, is 18 meters taller than the current record holder, organizers said. The tree’s steel-and-wire frame is covered with a plastic net decorated with more than 1 million natural pine cones painted red, gold, green and silver, 600,000 LED bulbs and topped by a 20-foot shining star. The tree cost $80,000. The Catholic Church criticized the tree as a “waste of money” and suggested that the funds better be spent on helping the poor. His claim is subject to confirmation from Guinness World Records, which said it has received an application from the organizers and that “it is currently pending evidence submission.” Gunasekara said that evidence is being gathered and will be sent to Guinness shortly. Currently, the record is held by a Chinese firm that put up a 180-foot tree-like tower of lights and synthetic foliage, ornaments and lamps in the city of Guangzhou last year. Organizers said they wanted the tree to help promote ethnic and religious harmony in the Buddhist-majority South Asian island nation. “This is just to show the world that we can live as one country, one nation,” said Arjuna Ranatunga, the former cricket player and now government minister of ports and shipping in an interview with The Associated Press. Sri Lanka has “issues regarding religion, caste and race,” he said. In recent years, Sri Lanka’s reputation as an inclusive multicultural country has suffered amid complaints by minority Christian and Muslim communities of state-sponsored discrimination, as well as allegations of widespread abuses against minority ethnic Tamils both during and after the country’s civil war against Tamil rebels, which ended in 2009. Hundreds of Sri Lanka’s port workers and volunteers struggled for four months to put up a towering Christmas tree in time for the holidays. But work was suspended for six days in early December, when Cardinal Malcolm Ranjith -- representing the island nation’s 1.5 million Catholics -- lambasted the project as a waste of money. Prime Minister Ranil Wickremesinghe responded to the criticism by saying the tree was not being built with public money, but with donations from individuals and private firms. But work suspension forced the workers to miss the initial deadlines set for Dec. 15, and then another on Tuesday and finally reduce the original tall too. “Our target was to go up to 100 meters (325 feet), but due to the construction delays we had to stop at 238 foot as we need to open it on time for Christmas,” Gunasekara said. The tree will remain till Jan. 6.